This dish uses vincotto, also called saba. It's essentially concentrated grape must and can be used in sweet or savoury dishes. It's available at good delis and providores. Heat 1 tbsp olive oil in a large pan and gently fry leek rounds for a few minutes on each side until they colour and soften. Add vincotto and fig quarters. Simmer for 1 minute until figs are soft. Add vinegar and remove pan from heat. Salt skin side of each duck breast well, with a few good pinches on each piece. Place skin side down in a separate fry pan, without oil, and fry on medium flame for about 10 minutes. This will make skin crisp and remove most fat without overcooking meat. Discard fat and, keeping duck pieces skin side down, lower heat and cover pan for 2 minutes. Remove cover, turn heat to high and fry for 30 seconds. Remove duck breasts and place skin side up in vincotto pan. Bring to the boil then immediately turn off heat . Add a few turns of freshly cracked pepper. Remove breasts from pan and slice. 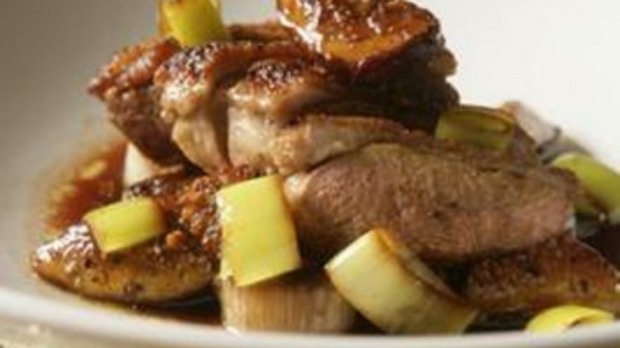 Arrange on individual plates or one platter with leeks and figs. Mix remaining olive oil with vincotto and spoon over top.